Arthur Peña's ('08) immerses himself in one creative project after the other. 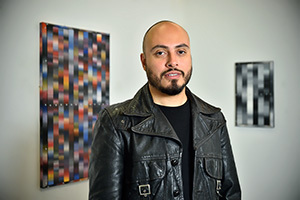 When Peña was a student at UNT, Matthew Bourbon, assistant professor of studio arts in the College of Visual Arts and Design, asked him how much time he spent on his classes in art history -- his major -- compared to painting. Peña said he spent six hours on art history and 40 hours on painting. "I knew that at that point I was more interested in painting than 16th century doorknobs," he says. Peña graduated with degrees in art history and studio art, studying sculpture, drawing and painting -- and his pace hasn't wavered since then. For the last few years, he's been making his mark in the art world for his paintings and was even the director of own his own art space for one year. His "roving music venue," Vice Palace -- in which the acts perform in art galleries and other locations in the DFW metroplex -- just celebrated its first anniversary. He received a $5,000 grant from the city of Dallas' Office of Cultural Affairs to start a label that will make cassette tapes recorded live at the Vice Palace concerts to offer a physical piece of art and history. And he was just named one of the Dallas Observer's 100 Dallas Creatives. Peña had always painted as a child, but his passion was fueled at UNT thanks to faculty members such as Mickey Abel, Denise Baxter, Vincent Falsetta and Annette Lawrence. After graduation, he found a warehouse in west Dallas that he made into an experimental art space called Ware:Wolf:Haus. He had his own paintings displayed in galleries in Houston and New York City and the Dallas Museum of Art, and now he could show other artists' pieces. "I had all this time and energy," he says. "I had friends who were making cool artwork. I just wanted tohelp expose their art to a broader audience." He also loves music and the theatricality of concerts. It was last year, after closing Ware:Wolf:Haus, that he began Vice Palace. "You plan for a show," he says. "Your friends are playing music. It's just fun. It's a different experience. I spend so much time with a painting and I have so much anxiety about it. Vice Place has in way become the celebration of life where my paintings are the mourning." The inspiration for Peña's paintings comes from a deep place -- what remains of someone after they are gone. He calls his works "attempts." "The newest stuff is very, very slow to make," he says. "The early paintings were very fast. It's a way for me to slow myself down and attempt to work through the inevitability of death and the impending void of nothingness. There is no other way to say it. The work has always come from that place. The paintings can be beautiful, but there's something manic about them."